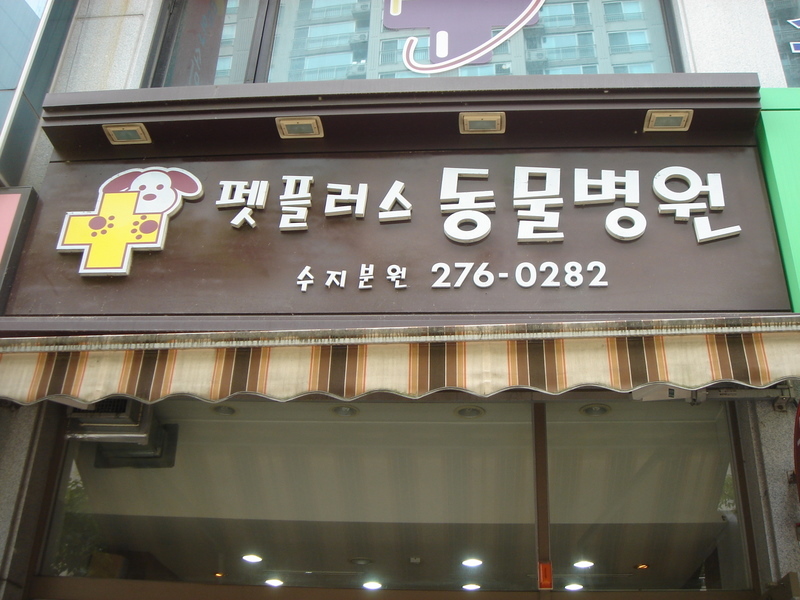 Found in Translation » Blog Archive » Learning 2 languages at once: English in 한글! One of the amazing things I found about learning a new script like 한글 (hangul, the Korean alphabet) in a language where there are lots of borrowed English words is that after learning the script in the first few weeks of class, you can actually read thousands of words. Not native Korean words necessarily (although if you’re learning to write a language that you already speak, that can open up vistas to thousands of words too), but all the words that have been transliterated into Korean from English. If you’re starting to study Korean, you might have seen a few already in the vocab lists for the first few chapters. But if you have the chance to see what’s written on signs, advertisements, posters, and other language on the street, in subway stations, and in other public places, the reality of the number of borrowed words can really hit you. And it’s a pretty amazing experience to be able to read a lot of words written in 한글 after only a few weeks, with all the colors, font styles, and contexts that give clues about what you might be seeing…and practice reading real texts at the same time! So I’ve taken some pictures and will put a few here, to see what you think. What do these signs say? What are they selling, doing, or telling you, the reader? 그럼, 여러분, 한국어를 열심히 공부하세요!! a. For the first one, focus on the big letters (blue – red – blue). The little drawings should help you out. b. In this next one, just focus on the smaller letters on the left (the bigger words on the right describe what the business is, and the words should be in the textbook). Again, the picture tells the story! 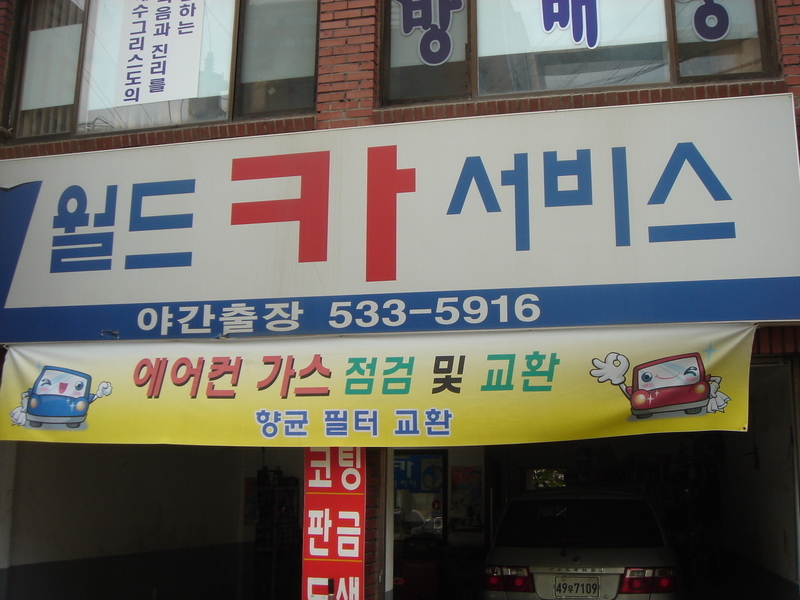 c. This last one might be a little harder to read…have you seen 한글 written like this before? Yeah, there’s a lot of stylizing in these fonts and all around the streets, really. I wonder if there are people who ‘translate’ fonts like Helvetica across scripts. And if you’re in the business of translating fonts, would you translate formal principles, or start at the level of connotation? It really should be a kind of different and enjoyable experience. I wondered whilst I was reading this post. How do Chinese, Japanese etc. write in computer? They have a different character for each words, so how’s a Chinese keyboard? I have just read your post Dave and I remember we discussed a bit about the pedagogical value of Konglish (the English words used in Korean). Konglish is a great tool for beginners in Korean. First of all, it’s a good practice and students can actually check by themselves that their reading is correct. Then as you mentioned, after just few hours of learning a new alphabet, being able to read and understand words, is a delightful feeling for learners. And they will need those delightful feelings because learning Korean is really a lot of work!